ICC/IF: Rat astrocytes. WB: Rat and mouse brain lysate. Apteronotus leptorhynchus brain tissue lysate. IHC-P: Rat hippocampus tissue. Mouse brain tissue. IHC-Fr: Human brain tissue. IHC-PFA fixed frozen: Mouse hippocampal tissue. Rabbit eye tissue. Flow Cyt: Human brain cells. Concentrated IgY fraction of egg yolks. Our Abpromise guarantee covers the use of ab4674 in the following tested applications. IHC-Fr 1/1000 - 1/5000. Try this antibody at about between about 1:1,000 using fluorescent secondary antibodies or 1:5,000 using peroxidase or other enzyme linked methods. IHC-FoFr 1/1000 - 1/5000. PubMed: 20098733Try this antibody at about between about 1:1,000 using fluorescent secondary antibodies or 1:5,000 using peroxidase or other enzyme linked methods. We recommend using ab46969 goat anti-chicken IgY FITC secondary antibody. Expect to see a band at 55kDa and another at about 48kDa, apparently a breakdown product of the 55kDa band. Try this antibody at about between about 1:1,000 using fluorescent secondary antibodies or 1:5,000 using peroxidase or other enzyme linked methods. Immunohistochemistry (Formalin/PFA-fixed paraffin-embedded sections) - Anti-GFAP antibody (ab4674)Elmore MR. et al PLoS One. 2015 Apr 7;10(4):e0122912. doi: 10.1371/journal.pone.0122912. eCollection 2015. 10x and 63x z-stack images of the CA1 hippocampal region for each treatment are shown, with NeuN staining in green and GFAP staining in red. Two month-old wild-type mice were placed on either control (n = 10) or inhibitor diet (PLX3397, provided at 290 mg/kg chow; n = 14) for 21 d, causing the elimination of approximately 99% of microglia brain-wide. Fluorescent immunolabeling of the microglia followed a standard indirect technique (primary antibody followed by fluorescent secondary antibody). 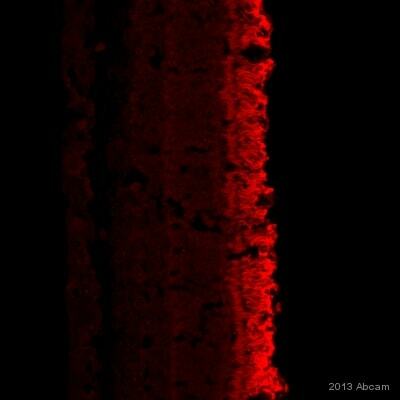 Brain tissue (sliced at 40 μm) was stained using the anti-ionized calcium-binding adapter molecule 1 (IBA1, polyclonal, rabbit) antibody (1:1000; Wako, Cat. #019–19741), mounted on slides, and coverslipped using Dapi Fluoromount-G (SouthernBiotech). Half brain images were obtained by stitching using a Zeiss AxioImager M2 upright microscope and Stereo Investigator software package from MicroBrightField. In addition, tissue was stained with anti-hexaribonucleotide binding protein-3 (NeuN, monoclonal, mouse) antibody (1:1000; Millipore; Cat. #MAB377) to label neurons and anti-glial fibrillary acidic protein (GFAP, polyclonal, chicken) antibody (1:500; Abcam; Cat. 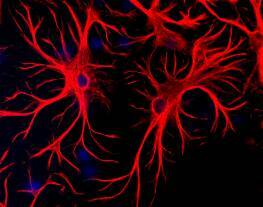 #ab4674) to label astrocytes, and 10x and 63x z-stack images obtained for each treatment using confocal microscopy. 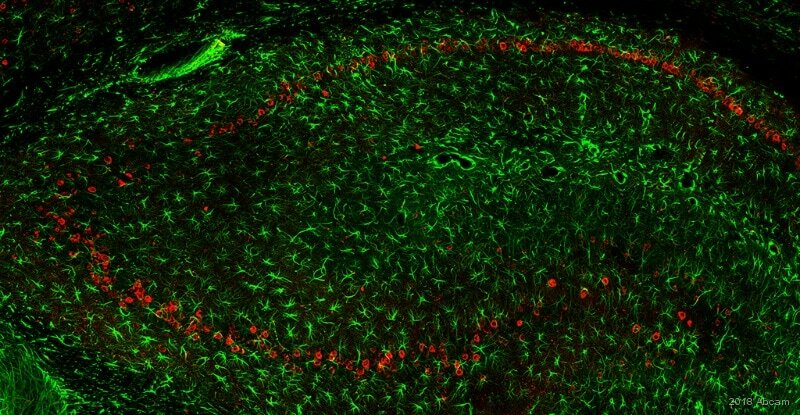 Immunofluorescent analysis of a section of mouse hippocampus stained with ab4674 at a 1:5,000 dilution in green. Costained with a rabbit pAb to FOX3/NeuN dilution 1:5,000, in red. The blue is DAPI staining of nuclear DNA. Following transcardial perfusion with 4% paraformaldehyde, mouse brain was post fixed for 24 hours, cut to 45 μM, and free-floating sections were stained. 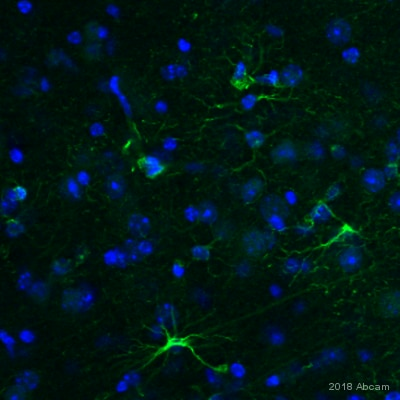 The GFAP antibody stains a network of astroglial cells while the Fox3/NeuN antibody stains the nuclei and proximal perikarya of neurons. IHC image of GFAP staining in a formalin-fixed, paraffin-embedded mouse normal brain tissue section. The section was pre-treated using pressure cooker heat mediated antigen retrieval with sodium citrate buffer (pH 6). The section was incubated with ab4674 at 1/1000 dilution for 15 minutes at room temperature. A goat anti-chicken biotinylated secondary antibody was used to detect the primary, and visualized using an HRP conjugated ABC system. The section was counterstained with haematoxylin and mounted with DPX. 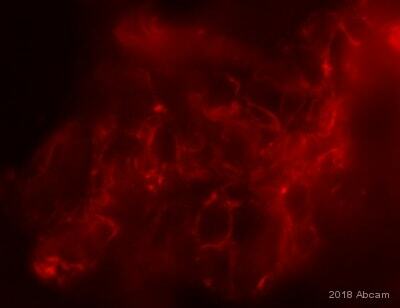 Rat astrocytes stained with ab4674 (red). The anti-GFAP antibody was used at a dilution of 1:50 from affinity purified material using our standard fixation and staining procedure (in protocol section). Hoechst dye reveals nuclear DNA in blue. ab4674 staining GFAP in human brain cells by Flow Cytometry. ab4674 staining GFAP in mouse hippocampus tissue section by Immunohistochemistry (PFA perfusion fixed frozen sections). Tissue samples were fixed by perfusion with 4% PFA and blocked with 10% serum for 30 minutes at 25°C. The sample was incubated with primary antibody (1/500) for 16 hours at 25°C in 10% NGS in PBS + 0.1% TX100. An Alexa Fluor®488-conjugated Goat polyclonal to chicken IgG was used as secondary antibody at 1/400 dilution. Staining was intensified with 2-3 minutes of retrieval with trypsin at room temperature. ab4674 staining GFAP in rat primary astrocytes by ICC/IF (Immunocytochemistry/immunofluorescence). Cells were fixed with paraformaldehyde, permeabilized with 0.05% Triton X-100 and blocked with 5% serum for 20 minutes at 20°C. Samples were incubated with primary antibody (1/2000) for 24 hours at 4°C. ab6873, a goat anti-chicken IgY FITC (1/1000) was used as the secondary antibody. Frozen sectioned human brain stained for GFAP with ab4674 (1/500 dilution, 18 hours at 4°C) in immunohistochemical analysis. 10 µm cryostat cut sections fixed with 4% PFA prior to staining for 10 minutes. Goat polyclonal anti-chicken-Alex-Fluor®647 was used as the secondary at a 1/250 dilution. Micrograph demonstrates astrocyte processes (blue) next to cerebral vessels (red). ab4674 staining GFAP in rabbit eye tissue sections by Immunohistochemistry (PFA perfusion fixed frozen sections). Tissue samples were fixed by perfusion with formaldehyde and blocked with BSA for 2 hours at 4°C. The sample was incubated with primary antibody (1/1000) at 4°C for 12 hours. ab150175, a goat anti-chicken IgY Alexa Fluor® 647 (1/1000), was used as the secondary antibody. 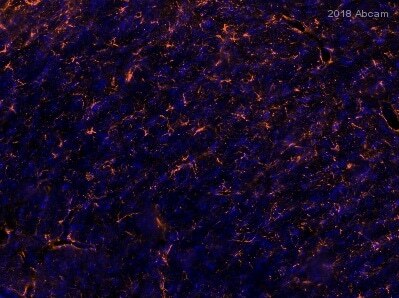 IHC image of GFAP staining in a formalin fixed, paraffin embedded normal rat hippocampus tissue section. ab4674 detecting recombinant GFAP by direct ELISA. Mouse recombinant GFAP protein was coated onto a microplate in carbonate coating buffer pH 9.6 for 1 hour at 37°C. Plate was blocked with 3% BSA for 1 hour at 37°C and incubated with the primary antibody (1/5000 in PBS + 1% Tween-20) for 1 hour at 37°C. An undiluted alkaline phosphatase Goat anti-chicken IgG polyclonal was used as the secondary antibody. 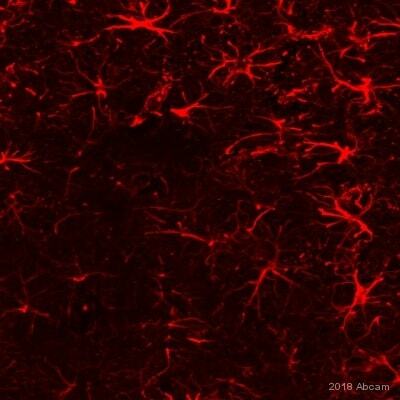 GFAP antibody ab4674 was used with Tissue Clearing Kit ab243298 to penetrate, stain and clear a 500 μm section of rat brain. Publishing research using ab4674? Please let us know so that we can cite the reference in this datasheet.